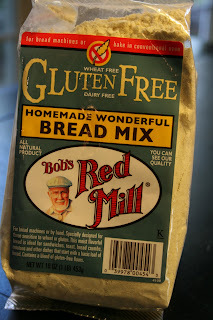 This started with a crazy loaf of Bob's Red Mill Gluten Free Bread Mix. 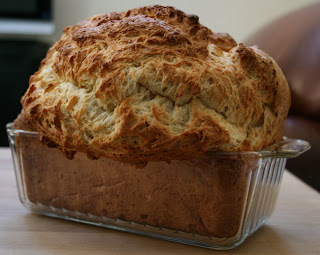 This loaf of bread came alive in the oven! I don't know if this is typical, so I will be interested in trying it out again. As you can see, it fell a little after it cooled. 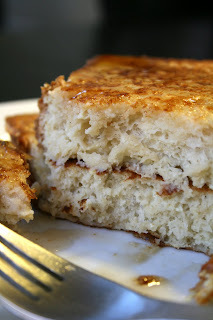 Still thick and perfect for the illustrator's French toast this morning! He was definitely happy about this. It has a slightly bitter taste to the crust, but not as bad as the Pamela's Mix did. Not that Pamela's was bad, it just had a stronger sorghum flavor than he liked. One thing I have definitely learned about gluten free food is that you have to find the right flavor and texture that suites you. Mix together the egg, almond milk and nutmeg in a shallow bowl. Coat both sides of the bread with the custard mixture. Cook in a nonstick griddle coated with cooking spray to desired toastiness! Serve with your favorite topping. I have to say, I am getting a lot more comfortable with the gluten free thing. There is a crazy science to it. The consistency of all of the flour mixtures is different. I am constantly amazed at how they all differ from start to finish. I would like to make my own mix for sandwich bread, but for now I am taking baby steps with learning how all of these flours work. It is always nice to have a quick version on hand too! As you can see...the illustrator was a very happier camper this morning! Since this post is mostly about the illustrator...I will share a little bit of his news here too. This month was the launch of a new comic book published by Del Ray (the first comic book by Del Ray) of Stephan King/Peter Straub's The Talisman...my husband is the illustrator of the interior artwork! This will be collected into trade and sold through Amazon! I am so happy for him! 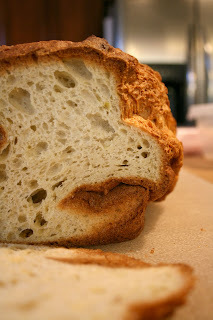 That bread is bananas - I've never had bread do that before! 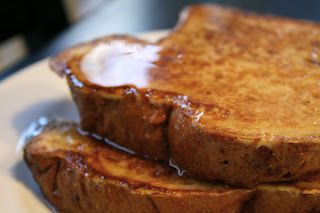 Your french toast looks awesome! And congrats to you and Tony on The Talisman! Tony is truly one talented guy! Haha, I didn't see your post before our emails ... I guess you have tried Pamela's! Glad the Bob's worked out so beautifully ... now for a soy-free option! 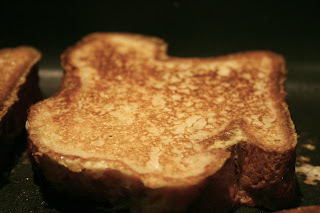 I am so glad that the Illustrator can now have his French Toast without risking death! As a fan I was really hoping he would survivie until the Talisman was finished.